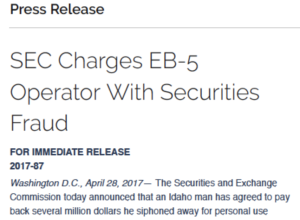 The U.S. Securities and Exchange Commission (“SEC”) settled charges against two U.S. citizens from Idaho, for stealing client funds intended for EB-5 Immigrant Investor Program projects. The EB-5 Immigrant Investor Program (“EB-5” or the “EB-5 Program”) is administered by the U.S. Citizenship and Immigration Services (“USCIS”). The Program was established to encourage foreign investment in U.S. businesses that would create jobs for U.S. citizens in the United States. Under the EB-5 Program, foreign nationals who make investments in specific projects in the U.S., that create or preserve jobs for at least 10 U.S. workers, are allowed to apply for U.S. residency. In its court Complaint, the SEC accused Serofim Muroff of misappropriating millions of dollars of client funds for his own personal use. Among his numerous titles, Muroff was the CEO of the Idaho State Regional Center, an EB-5 development office that was overseen by USCIS. Muroff also established multiple investment companies, such as Blackhawk Manager and ISR Capital. Those companies had the stated purpose of developing real estate projects and investing in gold mining ventures in the United States. Muroff’s Idaho State Regional Center sponsored his EB-5 securities offerings. Those offerings raised over $140 million for Muroff’s companies from foreign investors through the EB-5 Program. While some of the capital raised was used for the stated investments, Muroff allegedly siphoned off approximately $5 million of the investors’ money for his own use. Among the fraudulent uses described in the Complaint, Muroff used $1.1 million of the investors’ money to purchase two personal homes, $87,000 to buy two automobiles, $97,000 for personal expenses, and $423,000 to invest in a zip-line business. 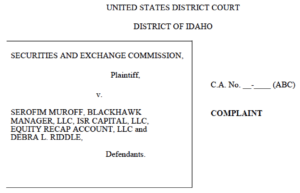 The Complaint also accuses Muroff of stealing client funds so that he could invest in options trading. He allegedly stole $20 million of investors’ money for this purpose. Muroff’s options trading resulted in a loss of more than $1 million. In addition, the SEC accused Muroff of violating the EB-5 rules by paying a Taiwanese company $5.6 million in commissions to solicit Chinese investors for him. Furthermore, Muroff purportedly used some of the investors’ money to purchase certain assets for himself, in violation of the EB-5 Program’s rules. He then resold those same assets to his EB-5 investment companies at higher prices for a sizeable personal profit. The SEC also charged Debra Louise Riddle with participating in the scheme and facilitating Muroff’s stealing client funds. Riddle was listed as ISR Capital’s Chief Financial Officer. However, she essentially served as Muroff’s bookkeeper and personal assistant. Riddle was accused of channeling investor’s capital out of the investment companies and into Muroff’s personal company, Equity Recap Account, LLC. From there she further channeled the money to Muroff for his personal use. The SEC also claimed that Riddle funneled the illegal commissions to the Taiwanese company that solicited investors for Muroff in China. Muroff also agreed to a ban from conducting EB-5 offerings, acting as an officer or director of a public company, and associating with an investment adviser.